First a little note: you can make the meringue by yourself. I didn’t have the time to make it by myself. I have the recipe; so if you need it, just let me know. 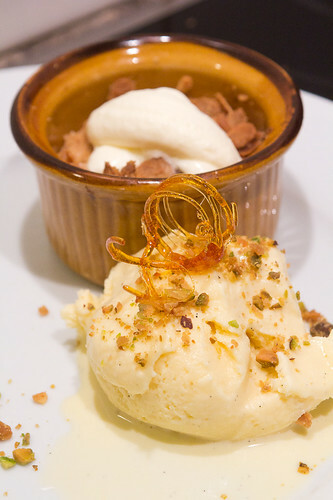 The recipe of the Ice Cream is almost the same like a “crème anglaise”. We made a “crème anglaise” before (link). It’s almost the same recipe. Beat up the yolks with the sugar “au ruban”. The mixture has to be almost white. You can do it by hand, but I almost every time use a a electric whisk otherwise it takes me too long. Heat the milk and the cream with the vanilla pod (cut in two lengthwise) on a low fire for about ten minutes. Remove the black vanilla seeds and add them to the milk and cream. Add the milk and the vanilla seeds to your egg and sugar mix. Stir and put it again on a low fire, stir slowly with a wooden spoon. Your milk and egg mixture should not boil. Around 75°C degrees is perfect, 80°C is ok, but more is dangerous. If it stays too long on the fire, it will start to clot. You can use a food thermometer or use a little trick. Take your wooden spoon out of the pan, draw a line on your spoon and if the line stays the same and the mixture doesn’t flow back, it’s ready. So take it of the fire. You will also see that your mix starts to get thicker. Now you can do two things. If you have an ice-cream machine, add your mix to your ice-cream machine and let it (do the) twist, boogie-woogie, swing and stir till your ice-cream is ready. If you don’t have a machine, add your mix into an ice-cold bowl. (*Just put the bowl in the freezer one hour before making the crème anglaise.) Put your bowl with the mix in the freezer. Every half hour you have to stir the ice cream very well. This is very important, because if you don’t do this, you will get ice crystals and that’s not tasty at all. After 5 hours, you will have ice cream. When do you add the amaretto and the meringue? You add the amaretto after a couple hours, when the mixture is already cold. The meringue, you first have to chop and then you can add it after one hour. How much ice cream do I have? You will have enough ice cream to give 8 people at least one scoop . What do you do? Take a pan and melt the butter. 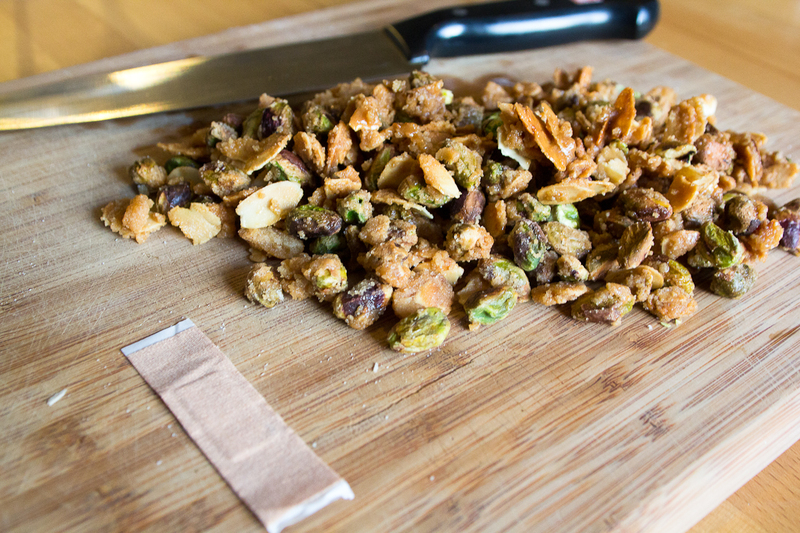 Add the sugar, the almonds and the pistachios. Stir constantly while the sugar is caramelizing. When your mixture is brown, take it out, put it on a cutting board and let it cool. Finally, chop the mixture till you have little pieces. The recipe is based on a recipe of www.kookkroniek.be. You will have a lot of “brésilienne”, but I guess you can keep it for a long time and just use it another time. Whipped cream: 100ml of cream, vanilla sugar. What you do? 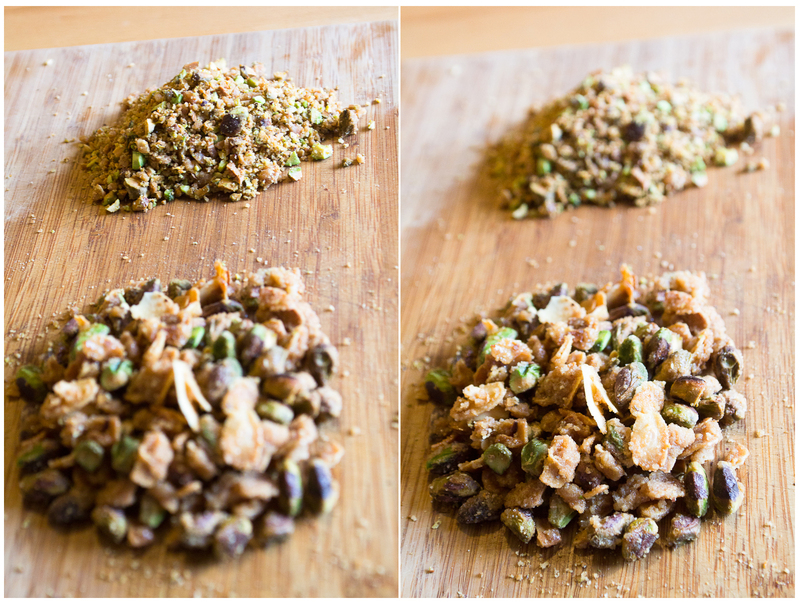 Start with the crumble. Mix the butter with the flour and the sugar, till you have crumbly dough. 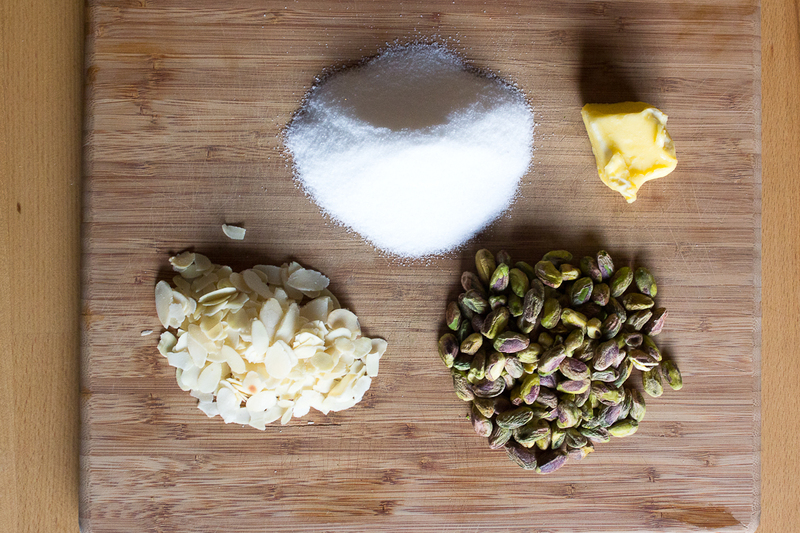 Add the almonds and the cinnamon. Rinse and peel the apples and the pears. Cut them into small cubes. Peel the grapes and cut them it two. Rinse the raisins. Mix all the fruit with the butter. Take a big or some small ovenproof dish and rub in with butter. Add the fruit and crumble the dough on top of the fruit. Put it in a preheated (180°C) oven for about 40 to 45 minutes. Don’t forget to have a look regularly. While your crumble is in the oven, make your whipped cream. Whip the cream and vanilla sugar, till you have… of course whipped cream. Put it aside. Take your crumble out of the oven, serve with whipped cream and some roasted almonds. Enjoy!